The Hurt Locker-A current war story which is nominated for a bunch of Oscars this year. There are some gory parts so this movie isn't for people who don't like blood! But it's a very real depiction of war and what soldiers have to go through on a daily basis. Good film! Fantastic Mr. Fox-Based on a children's storybook, this is an adorable claymation film. It is primarily a children's movie, however there is a lot of adult humor in it that I really enjoyed. I found myself often laughing out loud during it. Famous character voices include George Clooney and Meryl Streep. A very cute film! Nine-A movie based on a musical based on a movie! The original film is an old classic, 8 and a half. It was then changed into a musical for Broadway and this current movie is a film adaptation of the Broadway musical. It stars pretty much everyone (Daniel Day-Lewis, Nicole Kidman, Penelope Cruz, Marion Cotillard). While I love Daniel Day, he's more of an actor than a singer and that really showed in this movie. If you really want to see it, I'd wait to rent it. Avatar-I think everyone in the world knows what this movie is about, so here's my short review. Decent movie, great 3D special effects. Definitely see it in the theater if you get the chance because the movie might fall flat if you watch it on a small screen at home. Ok, that's the end of Part 1. Tune into tomorrow for Part 2. Happy watching! Today I had my Japanese lesson. I take Japanese classes every week and boy is Japanese difficult! I have learned a lot of vocabulary and most of katakana and hiragana (kanji is way too hard! ), and this week we started reading a book. My favorite book as a child was Curious George and I found it in a bookshop last weekend in Japanese! I thought it would be easy to read since it's a children's book, but it isn't! However, with some help from my teacher I'm slowly reading a Japanese children's book. Yay! I also discovered a used bookstore in my town which I love. I can't read anything, but I still think it's cool to have Japanese books. I think I will pretend to read a Japanese book while I ride the train so I can look the same as everyone else. 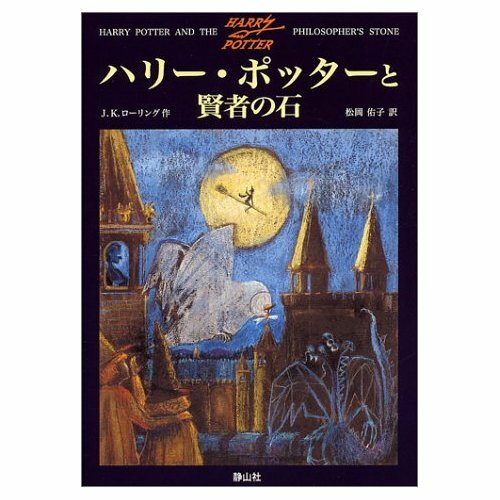 I found Harry Potter in the bookstore (another favorite of mine), and I bought it. I doubt I will ever be able to read it, but it's still cool to have a book you like in a different language. Wish me luck with my studying! I'm going to need it! Welcome to HELLO's online blog! My name is Corey and I have been HELLO's English teacher for the past year. Since this is my first entry, I thought I would tell you all a little about myself. First off, I'm from America and have loved experiencing Japan as my new home! I have eaten way too much sushi (except sea urchin and salmon roe-blah! ), but I still go to McDonald's quite often! One of my hobbies is running. In fact, I participated in last week's Kibiji Half Marathon. I finished without having to go the hospital-success! I also enjoy movies but haven't been able to watch many Japanese films since they don't have English subtitles. Japanese is difficult! Spring has officially arrived in Kurashiki and the weather is starting to get much warmer. I can't wait until the cherry blossoms bloom later this month and me and my friends can have picnics in the park! That's all for now! Thanks for visiting our blog. See you tomorrow!